Hey, guys! when you will start your jewelry business? are you still worried can’t find a special design? Unique kiosk main work on the design and build different types of mall jewelry kiosk and jewelry display cabinet. 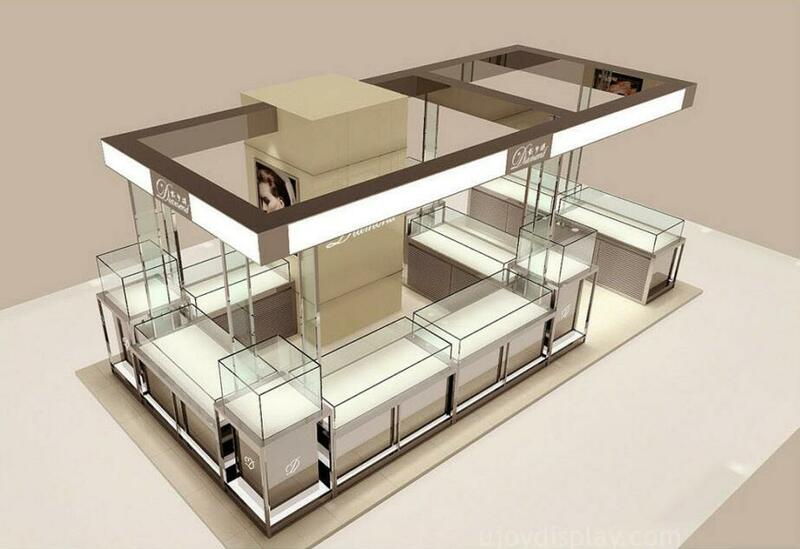 today I’m going to share is a nice and luxury jewelry kiosk design, it’s very popular in many shopping centers. 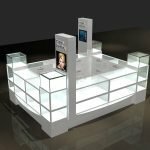 Basic information about this jewelry kiosk. Accessories: acrylic letter, led light strip. As you see the whole jewelry store, it’s very luxury and high-end, four sides using glass display cabinet, four high display stand on the corner, all showcase is hidden the led light strip, very bright and attractive. the customer can choose jewelry from different angles. the top part is a simple roof frame, with a led light strip and acrylic logo. with a pillar and some glass pillar support. 3. How can I customize a jewelry kiosk like this one? ２. Rent a store or a lease in a shopping mall, but need sure the location environment, Bustling, with enough people flow. If you have your own storefront, then you can decide all the details on your own. On the contrary, if it is used in the shopping mall, it must meet the criteria of the shopping mall, ( usually mall criteria mainly for material, height, and electrical wire safety, if your design team enough professional and experience, it’s Easy to approve）. 3. Find a direct supplier make a 3d design and drawings. — as a direct supplier, before designing we will confirm the shop layout, style, color match, material request etc . also can give you some professional advice. then we will start design and put all of your ideas on it. confirmed the design and start making drawings. ( you can see all details here, with each part size material and surface finished details, will according to the drawing production ) . Thanks for your time and reading. hope this article is helpful for your business. if you wanna further info or interested to start your jewelry store, pls direct contact us send an inquiry, thank you!